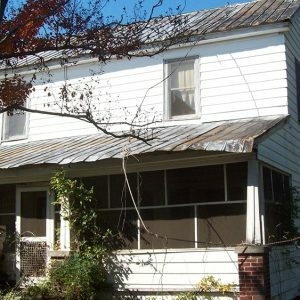 The Jacob Bedenbaugh House, built c. 1860, is significant in social history because of Jacob and Sarah Bedenbaugh, an interracial couple who weathered the prejudices of a society that was bent on keeping whites and blacks separate. Jacob purchased the property in 1858 and the two-story I-house was constructed shortly thereafter. Sometime between 1860 and 1864, he entered into a relationship with a mulatto woman named Sarah. Laws prevented the couple from marrying and both were prosecuted for fornication. They remained together, however, for approximately 42 years and produced eight children. Jacob died in 1915 and Sarah died in 1936.